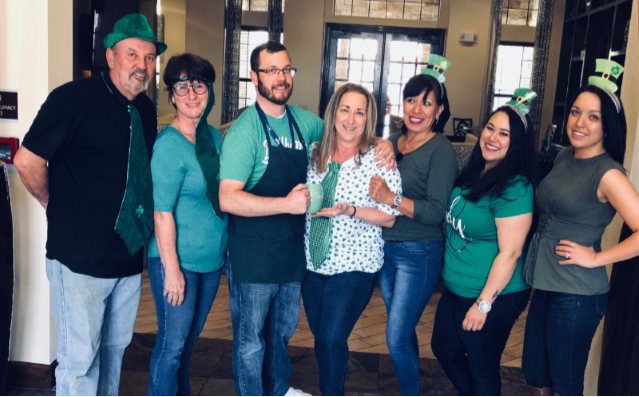 We’ve made a Leader Promise to our employees to “make time to have fun and celebrate success,” and St. Patrick’s Day is definitely a great opportunity for our teams to do just that! Venterra teams and residents celebrated with resident activities, snacks, decorations, and a St. Patrick’s Day Fun Friday. We got our green on to celebrate the holiday in a big way! Check out our teams enjoying all the St. Patrick’s Day festivities below! We loved seeing all our teams across the Venterra community portfolio go green again this year and are looking forward to more holiday and Fun Friday excitement to come! If you know someone who should be having a good time along with us, send them our way, and you could end up with a little extra gold in your pot in no time! So, how did you celebrate St. Patrick’s Day 2018? Let us know in the comments below!